Originally published under the title "A Surprising Solution to Illegal Immigration: Greece Sends Refugees Packing with a Helping Hand." 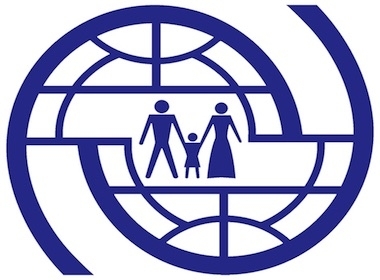 The International Organization for Migration logo. ATHENS – As Western states prove incapable of deporting their millions of illegal migrants – the current crisis features Italy – authorities in Greece have found a surprising and simple way to convince them to take the long route back home. The migration crisis simmered in Greece at about 10,000 illegals arriving a year. Then, thanks to a combination of violence in Syria and welcoming words from Germany's Chancellor Angela Merkel in 2015, that number surged to 10,000 illegals a day pouring into Greece. Coming mostly from Turkey, they made their way unimpeded to such favored destinations as Germany and Sweden. Eventually, as the borders to northern Europe clanged shut, over 62,000 migrants found themselves "stranded" (in the nomenclature of the United Nations' International Organization for Migration) in Greece. Unable to reach their destinations of choice, they could not find work or sympathy in a Greece going through economic crisis, and they refused to return to Turkey. Greece has found a simple way to convince illegal migrants to return home: treat them with generosity and respect. At this point, the IOM director in Athens, Daniel Esdras, devised a creative solution to encourage stranded migrants to take the difficult step to give up their European dreams, dreams for which they sacrificed time, money, self-respect, and perhaps endangered their lives, and instead to return to their homelands. The solution, it turns out, is counterintuitive: treat them very, very nicely, with generosity and respect, then spread the word widely. That is the experience since the opening in December 2015 of a hostel for impoverished returnees, 80 percent male, as they went through the one-to-three-month process (including in-depth interviews by embassy personnel) to arrange their departure. Burdened with the arch-bureaucratic name of the Open Centre for Migrants Registered for Assisted Voluntary Return & Reintegration (OCAVRR for short), the hostel offers free residence to illegals (or, in its delicate parlance, "irregulars") who of their own will have agreed to be returned to their countries of origin (other than war zones, namely Libya, Somalia, Yemen, Syria, and parts of Afghanistan). "Open centre" means the residents (whom staff politely refer to as "beneficiaries") may enter and leave the building at will. 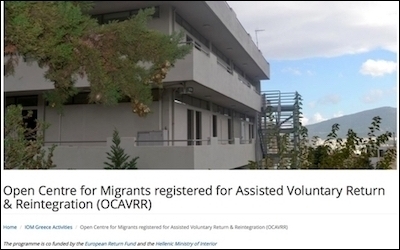 Located in a posh part of Athens with excellent vistas and co-funded by the European Return Fund and the Greek Ministry of Interior, OCAVRR provides up to 120 residents at a time with air-conditioned rooms; three catered meals a day; linens, toiletries, and basic clothing; health care and medicines; psychological counseling; and social workers. It also offers Wi-Fi, large Blu-Ray televisions, telephone cards to call home, 1 toilet per 4 residents, and 1 shower per 9 residents. Bathrooms and floors are scrubbed through the day by a cleaning service; residents need only make their beds and wash their clothing in the free laundry machines with free soap. Families get private rooms. Interpretation is offered in nine languages. A Greek staffer joked that OCAVRR may be the only building in all of Athens completely up to the fire code. He also noted that an ambulance would get to a returnee faster than to his house. 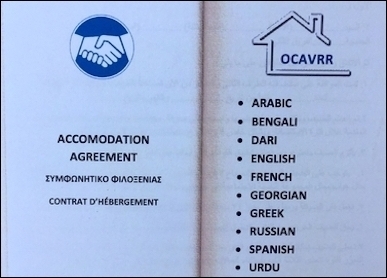 Front page of the OCAVRR contract in multiple languages. Residents must sign an "accommodation agreement." Smoking, alcohol, guests, and pets are prohibited. A criminal record, drug addiction, or a communicative disease disqualify one; armed guards and an airport-style metal detector at the entrance of OCAVRR assure security. Of the 80 OCAVRR current residents when I visited, 79 were Muslim (the other a Georgian Christian). Every meal is halal. All toilets are outfitted with water sprays. The prayer room is exclusively for use by Muslims and a refrigerator by the front door holds food for residents keeping the Ramadan fast, though a surprisingly small number of residents pray or fast. Of the 2,200 returnees who have passed through OCAVRR, 94 percent eventually left Greece for home. On leaving, they receive €500 (US$570) in pocket money and a promise of €1,500 for in-kind support to get them economically on their feet (livestock, a taxi, and a sewing machine are common purchases). Making the inherently difficult return process more pleasant and dignified is a winning formula. The total spent per person is about €4,000, less than 1 percent of the welfare, unemployment, health, and other spending on the typical long-term illegal migrant. Subsidizing the inherently difficult process of returning home to make it more pleasant and dignified is a winning formula; indeed, every Western country suffering from the problem of illegal migrants can learn from, adapt, and scale up this model to its specific circumstances. Done right, large numbers of former illegal migrants will be in business in their homelands.